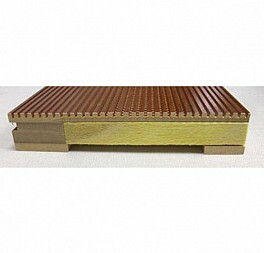 Provide broadband sound absorption in a beautiful custom wood panel that mounts to both wall or ceiling surfaces. The panel includes a sound absorptive core with a solid frame and is ready to install on Z clips. As a completely finished and custom sized composite panel, Ensemble’s installation labor is greatly reduced in comparison to field-built perforated wood panel or plank products that require a build out of furring and acoustical core in addition to finish trim. The Ensemble installation procedure is similar to other acoustical panels, utilizing z-clips on the panel back that mount with z-bar or clips on the wall or ceiling surface. Wood veneer selections are extensive and the finish can be stained and clear coated per the designer’s request. Options also include FSC certification. Ensemble is a complete acoustical panel that includes the sound absorbing core and a frame. Panels are custom sized allowing the designer to create acoustic wood interiors on walls or ceilings with panels up to 48 inches (1220 mm) x 96 inches (2440 mm). The panels face is grooved to create perforations and paths for sound to be absorbed. Stain matching is available with the understanding that the Ensemble’s grooved wood surface alters the overall coloration relative to stained solid woodwork. The panels can be supplied with matching wood trim for field installation or the panel edges can be finish banded or veneered as required. The panel composite includes an MDF Backer and framing unit combined with a fiberglass acoustical core. The face is made up of a hardwood veneer laminated to MDF and grooved front and back to create perforations open to the acoustical core. The standard acoustical core is 1 inch (25mm) thick fiberglass in the Ensemble 1.0 or 2 inch (50mm) thick fiberglass in the Ensemble 2.0. Ensemble 1.0 weighs approximately 2.6 lbs. per sq. ft. Ensemble 2.0 weighs approximately 4 lbs. per sq. ft.